Barter attracts new customers over and above your established clients. Barter generates value from your excess inventory and idle time. Barter improves your cash flow without increasing overhead. Without Spending Any of Your "Hard-Earned" Cash. Barter is a tradition as old as the first business on earth. Yet, it is as innovative and profitable as any new technology of the 21st century. 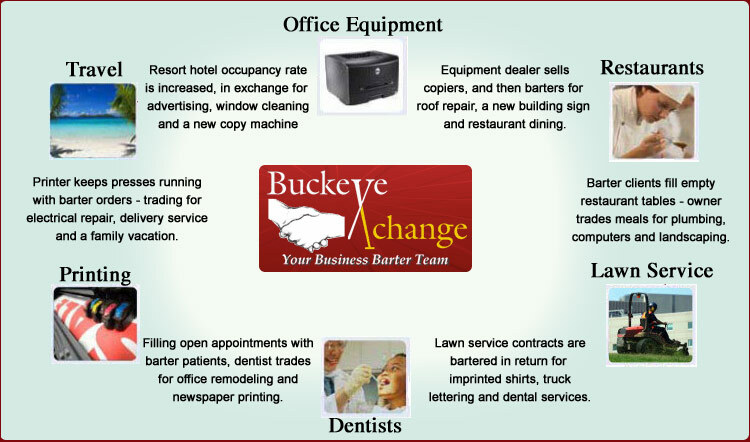 Buckeye Xchange is a barter network of businesses and services that spans from the local to the national level. Instead of purchasing the items you need or want with cash, by joining Buckeye Xchange you have the ability to make these purchases with trade dollars that have been earned by selling your company's product, service, excess inventory and increase your competitive edge with other active barter members. In the U.S. over 470,000 businesses actively use organized trade to supplement their cash transactions. As a Buckeye Xchange member your business is able to finance the purchases of things you need out of additional sales of your own product or service. With thousands of business owners alerted to your business upon joining Buckeye Xchange, and constant awareness through our website, email and account managers and brokers...your sales will increase. Buckeye Xchange opens the door to a new group of potential customers, partners and allies who will bypass traditional 'cash' vendors to work with you through Buckeye Xchange. Barter creates new customers because buyers are motivated to pay with their products or services and save cash. Simply put - if you had to purchase an outdoor sign for $2,500 - what would you rather do? Write a check or pay with an equal amount of your products/services at its normal selling price to a new customer? Most businesses prefer to trade and conserve cash. 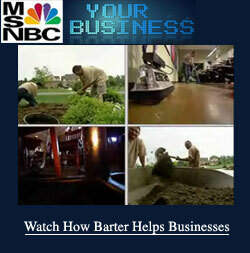 When you purchase through barter, you pay with trade dollars. Replacing some cash expenditures through Buckeye Xchange can improve your cash flow. Yes, we said new CASH sales! If you perform a good job for a Buckeye Xchange client, they'll refer their cash-paying friends, clients, family and associates to you. Growing your business will always be tied directly to referrals from your happy customers. Buckeye Xchange constantly strives to help improve your bottom line overall. If you become more successful, we become more successful. Buckeye Xchange trading takes the hassle out of collections. When you make a barter sale to a Buckeye Xchange client, you call in advance for authorization to verify that your client (the buyer) has the Trade Dollars to pay for their purchase from you. Then, upon order completion or delivery, a simple signed transaction slip submitted to Buckeye Xchange will confirm the transfer of funds. It's that simple. One of the great benefits to your company is the incredible exposure you'll receive through Buckeye Xchange and our affiliates. Buckeye Xchange gives you exposure to new markets, brings in new customers and provides new networking opportunities. Buckeye Xchange can help you sell off your excess inventory and idle capacity, which you can convert to something you need. This allows you to maximize productivity by staying busier and more profitable all year round. Buckeye Xchange takes care of the paperwork, keeps track of the transactions, makes sure you are apprised of the options you have in the membership. Buckeye Xchange works as a clearing house that connects you to a vast network that will maximize your opportunity to have your business grow and become more profitable. Through Buckeye Xchange you have access to more options and alternatives, to help you compete in your market. You can advertise, market and promote yourself using Buckeye Xchange media company members: radio, magazine ads, etc. Have your brochures designed and printed and get your websites through barter. Your cash sales can increase, as well! Buckeye Xchange members tend to first look to other Buckeye Xchange members when they need to purchase something. Then, they will likely call you again when they need more. You may get members placing personal purchases with you, as well as business purchases. When you increase your sales and keep your costs down, your income will rise. It's simple arithmetic! See if it works for you. Why Be a Member of Buckeye Xchange? Buckeye Xchange is an innovative 21st century barter network, headquartered in the Akron/NorthEast Ohio area. Buckeye Xchange is dedicated to providing its members a full service barter program that maximizes your business profits and productivity. We are committed to helping each member reach and exceed their business goals. By joining Buckeye Xchange, you will gain access to thousands of businesses and business owners who are ready to conduct trades. Using our trade network, Buckeye Xchange will introduce you to new business relationships that will result in you saving cash when you spend the trade earned from completed trade transactions with this group of businesses. Providing a broad and comprehensive list of products and services for both business requirements and personal needs that are readily available. In addition, we are linked to a network of other barter groups that permits Buckeye Xchange to market your specialty product or service to businesses outside our region. Product offerings from these exchanges are available to be sent to you directly for purchase consideration. Buckeye Xchange markets your company to hundreds of local businesses and thousands of businesses nationally. Creating a new network of customers to increase traffic flow, sales & profits. At Buckeye Xchange your business is individually assigned to a professional trade broker who will provide personalized hands on service and attention to your needs. Your Buckeye Xchange broker's role is to help you find and facilitate trades (sales and purchases). Your broker will stay in frequent contact and will network and promote your business as you work towards establishing the barter aspect of your revenue stream.